While the trial of Bradley Manning has sparked some interest in certain circles, many people probably think the former U.S. Army private’s case will have little impact on either them or American society as a whole. Harvard law professor Yochai Benkler, however, argues that they are wrong — and that if Manning is found guilty of “aiding the enemy” for releasing classified documents to WikiLeaks, it could change the nature of both journalism and free speech forever. Why? Because as Benkler points out, the charge for which Manning is being court-martialed could just as easily be applied to someone who leaks similar documents to virtually any media outlet, including the New York Times or the Washington Post. In other words, if the U.S. government has seen fit to go after Manning and WikiLeaks, what is to stop them from pursuing anyone who leaks documents, and any media entity that publishes them? And we don’t have to hypothesize about whether the government would have gone after Manning for leaking documents directly to the New York Times instead of to WikiLeaks: as Benkler notes, the chief prosecutor in the case was asked that exact question by the judge in January and responded “Yes ma’am.” In other words, for the purposes of the government’s case against Manning, there is no appreciable difference between WikiLeaks and the Times, or any other traditional media outlet. Benkler argues that the government’s behavior constitutes “a clear and present danger to journalism in the national security arena” — not just because it is trying to penalize a whistleblower, but because the state is arguing that Manning is guilty of “aiding the enemy,” a charge that could put him in prison for life. Benkler also notes that unlike the other charges against Manning, aiding the enemy is something even civilians can be found guilty of. Isn’t the New York Times aiding the enemy too? So if handing documents over to a media entity that subsequently publishes them qualifies as “aiding the enemy” in the eyes of the government, then giving them to the New York Times would fit that description just as well as giving them to WikiLeaks. And if providing classified documents to a publisher can qualify, then wouldn’t the entity that actually published them be guilty as well — regardless of whether it’s WikiLeaks or the Times? 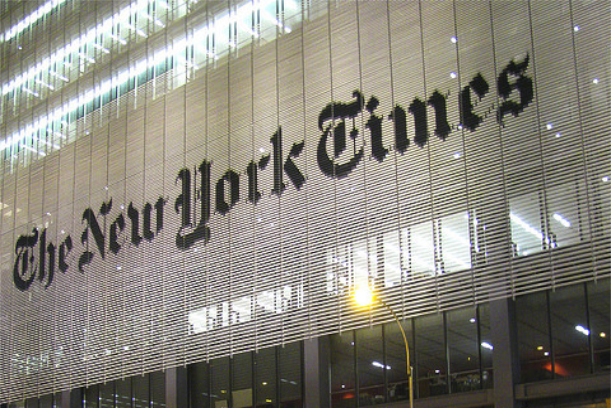 The First Amendment would seem to protect the NYT in a case like this, and I’ve argued before that it should protect WikiLeaks as well — an argument that former Times‘ executive editor Bill Keller has said he agrees with. But the U.S. government continues to pursue WikiLeaks for its role in publicizing the documents that Manning leaked, and some U.S. legislators have mused aloud about whether espionage charges could be laid against other media entities like the New York Times as well. Benkler’s warning shouldn’t be taken lightly: if Manning is guilty of aiding the enemy for simply leaking documents, then anyone who communicates with a newspaper could be guilty of something similar. And if the leaker is guilty, then the publisher could be as well — and that could cause a chilling effect on the media that would change the nature of public journalism forever. Without state secrets a state cannot conduct most diplomacy (as the other side of the table will often want to discuss matters in confidence), cannot have safe operations for intelligence officers (even the most seemingly benign clue could reveal their identitiy) and cannot possess any military technologies it does not wish to be broadly shared with its enemies(nuclear weapons, spy satellites, secure communications, missiles, jets, etc). This sounds nice for Switzerland but ultimately it makes a weak state that cannot stand against any enemies and will likely fall. Thus, allowing a soldier to steal and publicize state secrets creates a precedent that is cancer to the very idea of a state. We live in a country where all our communication is filtered through journanlists who control much of the flow of information, so they exaggerate their rights to supercede every other basic foundation of government. Freedom of speech never meant freedom to share stolen information, it meant freedom to share your opinions about religion, philosophy, etc. If you want to share state secrets there is a simple formula: run for public office, get elected, vote to unseal the documents. The Bradley Manning’s of this world fundamentally betray the democratic process, casting aside the wishes of generations of voters who by and large believe that confidential diplomatic negotiations are quite reasonable and stealing the privacy rights that voters have granted to diplomats and soldiers for our own good. The NYT’s is a propaganda outlet for the socialist left. It has become a joke to anyone who actually knows how to read. Kept afloat by dirty money from “Slim” the thing sits out there like a carcass that will not rot completely away, but foul the public arena day after day. I love it. From now on instead of giving classified documents to Russia or China or anyone else, just give them to NYT. I have no doubt NYT would be happy to print the plans for a nuclear bomb, and according to this author, they would be totally protected under the first amendment. Bradley Manning is an American hero who saw evil and tried to stop it because he was an American. As a vet i concur with what many people are saying. Manning had no journalistic privilege to leak material to a media outlet (Wikileaks or the Times, makes little difference.) He violated the rules that anyone serving (and even civilians) who have access to classified material must adhere to. If he felt like “whistle -blowing,” criminal behavior (and I would be the first to admit that some of his material IS of very questionable behavior to say the least.) He did have a chain of command to bring this material up with. If he felt a moral imperative to break his chain of command and his oath(s,) I suspect he needs to take his lumps for doing that. That being said, holding the fellow in solitary for dumping a bunch of classified muck on a “neutral” web page (I.E. not run by some hostile element) seems way beyond the pale to me. Mr. Ingram and Prof. Benkler set up a strawman here in order to confuse the issue and thereby promote their well left-of-center views on free speech. For the government has not and is not likley to file charges against WikiLeads. So whether one views WikiLeaks and the New York Times as comparable is wholly irrelevant. A ne’er-do-well little loser who couldn’t find steady employment elsewhere voluntarily turned to the U.S. Army, pledging loyalty in return for promised benefits. For him then to turn around and sell out to an anti-American anarchist and alleged sexual pradator the Army, other armed service members, diplomats and undercover allies on the ground in Iraq and Afghanistan is treasonous behavior that warrants the death penalty. To argue otherwise or conflate this immutable truth with esoteric discussions about the extent to which “journalists” should be held accountable for irresponsible discisions is an academic exercise all too representative of the “scholarship” emanating these days from the Ivy League law schools’ ivory towers. Here is a thought: Why not try and have the case thrown out because there is, simply, no ‘enemy’ to aid? The argument is this: the crime of aiding an enemy requires the US be at war and have an enemy that is identifiable on that basis. No declaration of war has been made, ergo, one cannot aid an enemy as the US currently has none. That might work in a civilian court but as another commenter pointed out, Manning is being tried in a military court that works under a different set of rules and laws. This matter show more than any before, that the US doesn’t really believe in a free press. If Manning was guilty he would have been tried in a civilian court, instead he is being tried by the military master that run the US. Active duty soldiers are always tried in a military court for a violation of UCMJ. Your statement is utterly incorrect, in addition to being illogical. He’s being tried in a military court because it was a military offense dingbat. By your “logic?” all those who are tried in military courts are by definition not guilty. I guess that makes Assan not guilty of mass murder as well. Otherwise he would be tried in a civilian court. Correct? Does that also mean that if one is tried in a civilian court that they are by definition guilty? Maybe this logic spares WikiLeaks, but if we are comfortable sending former CIA officers to jail for their leaks to the media – I am fine with this – Manning should go down too. Reprinting stolen documents isn’t journalism. It’s pathetic. To call this man a whistle blower is ridiculous he took information that he swore to protect and released it because he felt like it and in doing so risked the lives of countless people. He’s nothing but a coward. It’s dim to equate Manning’s prosecution to Wiki Leaks’ likely non-prosecution. Indeed Wiki Leaks and the NY Times are protected by the first amendment, but a soldier or diplomat who swore to protect state secrets and interests does not enjoy first amendment protection if he chooses to steal and indiscriminately release hundreds of thousands of classified diplomatic and military cables and documents. Manning should and will be prosecuted for violating his oath and US law. Manning and Wiki Leaks fail in my estimation to meet the definition of whistle-blower and journalist respectively because there is no coherent message, no discrimination, no commentary in their acts. They released a massive trove designed to injure the interests of the US, including many things no sane person would suggest helps any legitimate interest. Wiki Leaks will skate by the benefit of first amendment protections because it’s impossible to LEGALLY discriminate their shoddy document dump of a web site from a real journalist like the Times, but Manning has no legal refuge for his traitorous act. ..except the New York Times wasn’t employed by the US government, nor trusted to keep the sensitive information manning was entrusted with away from unauthorized personnel. So yeah, I think Wikileaks gets a free pass. Bradley Manning not so much. This isnt a story I have followed very closly but people seem to be forgetting that Manning gave up many of his rights when he signed up for the army as every military member does. Second, he is being tried in a military court that works under a different set of rules and laws. The author of this post is talking primarily about the New York Times and other media outlets. Your comment doesn’t deal with that. Why aren’t those responsible for the massacres he revealed being subject to military court as well. Is it truly a punishable offense to reveal such barbaric acts, but not to commit them. Is that our notion of a fair nation? Like I said, I don’t follow this story very close but I am unaware of any “massacres” that were revealed by the information that was given to wiki Leaks by Manning. You bring up a couple other issues: Demoting of civil standing (giving up rights) while serving the country, and the military having its own rules and laws. Sounds like the military is clearly not part of us and doesn’t have anyone’s interests in mind but theirs. Cancerous. The military holds themselves and those in it to a high standard. They also require many of their member to do things most people are not allowed to do. They are also always in the spot light for the world to see, representing our country. This requires them to be able to hold all of their members to that high standard and accountable at all times. I’m not saying it works all the time, but it is the idea. It is also why it is such a big deal when members do not follow these standards. well, I do not think that there is any big issue in it. They should not be guilty for this act !